Please meet the eighteenth Alabama Street cat to appear in the series. How can there possibly be so many? The skittish shorthair lives on the same block as Holiday, Laramie, Lupe, Precious, and Smokey. Long-time fixture Monkey recently passed away. I know the calico’s name, but didn’t check the spelling with her owner. Fifty-fifty chance, I pick Harley over Harlie. I observed her lurking among bushes and trees late afternoon on April 23, 2018. In a rare oversight, Leica M10 wasn’t with me and I used iPhone X to capture several portraits. The two money shots are pleasingly composed but strangely, and frustratingly, the feline isn’t precisely focused. Let’s make this a modern cliché: iPhone X can’t tell the cat from the trees. As such, the Featured Image and companion are not my first choices. Variances in color/white balance are unmistakable between them. Vitals, for the first: f/2.4, ISO 20. 1/120 sec, 6mm; 5:02 p.m. PDT. For the second, same timestamp: f/2.4, ISO 16, 1/60 sec, .97 ev, 6mm. 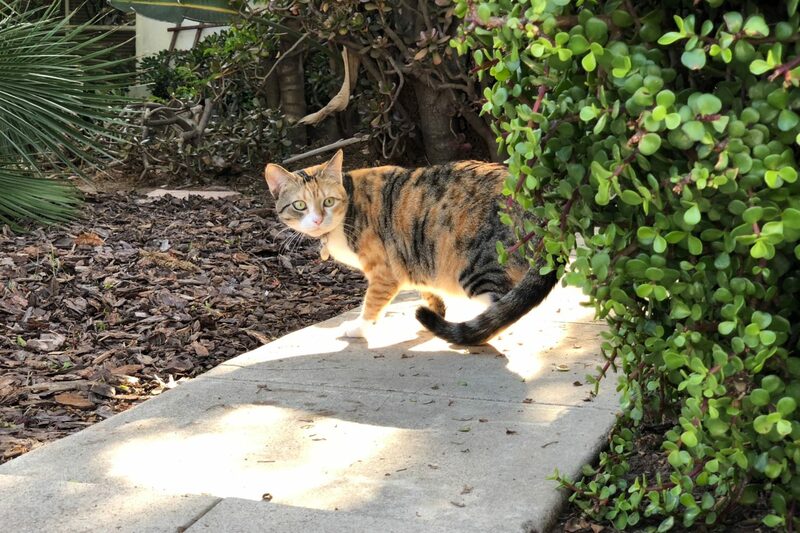 Harley gets occasional outdoor time—in this instance for a few hours—when her owner is home. I wonder how often are her jaunts? 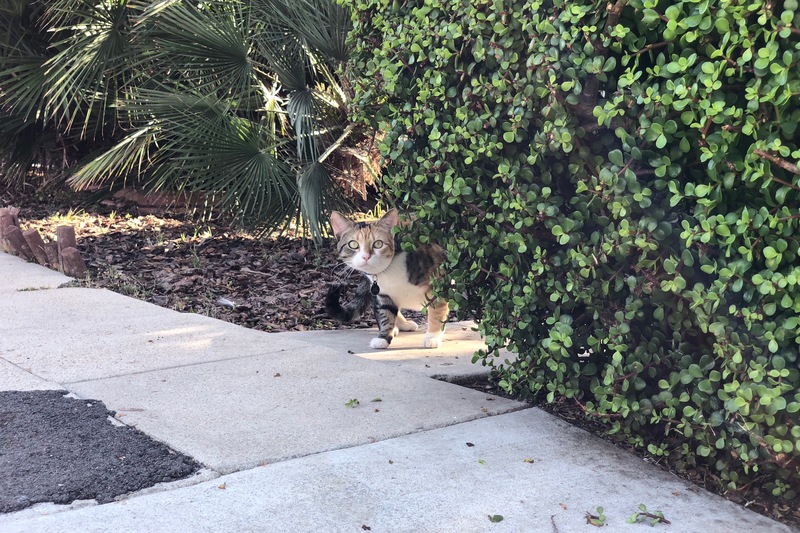 As a regular walker along this street, I am surprised to see the kitty only for the first time. She was worth waiting for. Eh? Also in this series: Scruffy, Roly Poly, Woo, Skull, Biscuit, The Colonel, White, Chipper, Frisky, Stretch, Needy, Farfisa, Mates, Hunter, Pee-Pee, Blue, Blue Too, Bonded Pair, Patience, Fess, Jumper, Frenemy, Looker, Cozy, Scout, Lurks, Skit, Mini, Betty, Black and White, Stalker, Bell, Chill, Sammy, Scratch, Poser, Star, Grey and White, Watcher, Herman, Comet, Roman, Willow, Chub, Nimbus, Watson, Lilo, Kit, Pepe, Twilight, Sebastian, Spot, Booger, Ash, Veruca, Riley, Mellow, Bonde, Flower, Glass, Black, BeBe, Fang, Bruce, Siamese, Pounce, Tortie, Haiku, Fraidy, Peso, Daniel Tiger, Dusk, Stride, Dainty, Spry,Tabby, Betty Too, Still, Levi, Shadow, Sophie, Wink, Ferals, Momma, Charlie, Tux, Cool, Benny, Jellicle, Itchy Valentino, Goldie, Nine, Amanda, Siesta, ChaCho, Charlie, Too, Mika, Crystal, Seeker, Mittens, Dancer, Smokey, Monkey, Captain Blackbeard, Season, Maven, Tink, Chunk, Curious, Hanoi, Bella, Tarry, Guido, Maxine, Mr. Kitty, Peohe, Panda, Frankie, Sunshine, Twain, Willow, Too, Brawn, Reddy, Burglar, Laramie, Lupe, Bright, Tom, Charm, Buddies, Boss, Ohana, Seer, Fresh, Token, Lola, Carl, Bramble, Finny, Cal, Tipsy, Zander, Mew, Penny, Charlie (the Third), Bob, Apple, Persepolis, Sebastian, Too, Holiday, Snow, Desire, Luci, Torbie, E.T., Bushy, Cali, Precious, Gracie, STAR, Sky, Amble, Aylin, Lucky, Herbie, The Love Bug, and Roadie.